I recently got cast in a production of Jonathan Dove’s Tobias and the Angel. The director’s vision includes playing up the ‘community opera’ origins of the piece. I’ve never been in or seen a ‘community opera’ before, so I had a few questions. What are they? Where and how are they performed? What are the most famous examples? Community operas tend to be small-scale (often one-act) works. You won’t find them being produced at the Met or the Royal Opera House–they’re written for more intimate venues. Many were called ‘church operas’ by their composers and, predictably, were based on Biblical stories and originally performed in churches. Several forms of community operas exist. Some are given the title because they were written to be singable by non-professionals and therefore to be staged by a local community, sometimes in collaboration with a core cast of professional singers. Others are professionally staged operas that were written with a particular local audience in mind. Britten’s Noye’s Fludde premiered in 1958 at Orford Church, Suffolk. Britten specifically requested that it not be performed in theatres. 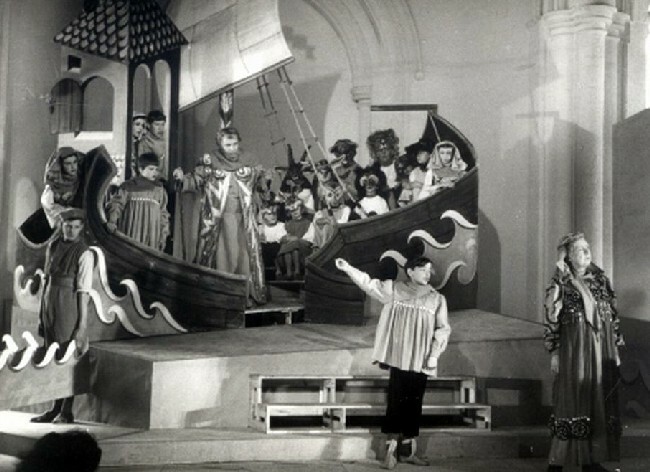 A rehearsal photo from the 1958 premiere of Britten’s Noye’s Fludde. Photo by Kurt Hutton. Britten’s Curlew River (1964), The Burning Fiery Furnace (1966), and The Prodigal Son (1968) are all ‘church parables’ that premiered in churches in Orford, Suffolk. Dove’s Tobias and the Angel premiered in 1999 at Christ Church, Highbury in London. Dove’s Hear Our Voice (2006) was a community opera project involving schoolchildren from various countries, but was performed in traditional theatre venues. Dove’s Hastings Spring (1990), Dream Dragons (1993), and In Search of Angels (1995) were all operas written for Glyndebourne Touring Opera with specific local audiences in mind. Dove’s The Palace in the Sky (2000) brought together professional singers and community choirs and bands for a performance at the Hackney Empire, London. Andrew’s Woodwose was performed at Wigmore Hall in 2013 by 140 members of the Westminster Community as the beginning of a three-year cycle of community operas. Perla’s Jonah and the Whale (2014) included school and community bands and choirs, and even had singing parts (based on American folk tunes) for the audience. It ran for two performances in the 3,000-seat Our Lady of the Angels Cathedral in Los Angeles. I’m sure there are more great examples out there. As far as I can tell, no one has written about or compiled a list of church or community operas, so they’re hard to find. Do you have favorites? Share in the comments!